Smacking boxes out of its hands, and pushing it face-first onto the ground are par for the course when testing a robot. "If you pause the clip here, you can see the exact moment where the robot feels betrayal." 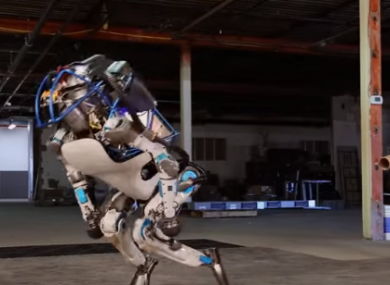 EVER SINCE ROBOTICS company Boston Dynamics was acquired by Google back in 2013, it has been releasing numerous videos showing off its developments. Ranging from dog-like robots or humanoid robots taking a stroll through the woods, its progress has been gradual but significant. Its latest update shows off Atlas, its next generation robot, which is the closest it’s come to a robot we recognise in fiction. Atlus is 5’9″ tall and weighs 81kg, smaller and lighter compared to its predecessor which was six feet tall and weighed 150kg. The robot is designed to function both outdoors and inside buildings and uses sensors in its body and legs for balance. To help it make its way around the world, it uses LIDAR (a remote sensing method uses light in the form of a laser to measure distance) and stereo sensors located in its head to navigate and avoid obstacles. As well as walking through the woods and buildings, it’s able to pick up boxes and stack shelves. More importantly, it’s not tethered to a power source like previous versions of Atlas. Yet the team behind it are still putting the robot through its paces by knocking boxes out of its hands and pushing it away. As well as just pushing it over so it falls face first onto the ground. The future is going to be great, right? Email “Watch Google's robot be bullied and terrorised by its creators”. Feedback on “Watch Google's robot be bullied and terrorised by its creators”.